Ranked #1 Bank in MA by Forbes! 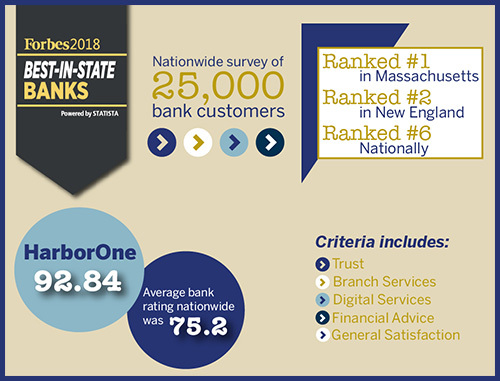 Thank you for making HarborOne the #1 bank in Massachusetts! Forbes recently conducted a nationwide survey to determine the best mid-size banks by state in the country. The survey reached over 25,000 people across the US asking them to rate banks in their state on several criteria including trustworthiness, financial advice, branch and digital services, and overall satisfaction. We are pleased to announce that MA consumers rated HarborOne as the best bank in MA! Additionally, our score of 92.84 ranked HarborOne as the number two bank in New England and number six in the United States. America’s Best-In-State Banks and Credit Unions were chosen based on an independent survey from a vast sample of more than 25,000 U.S. citizens spread among all states. The survey was conducted using an online access panel. Each participant was asked to name all banks / credit union’s where he/she has or previously had a checking / savings account. Participants had to evaluate banks and credit unions regarding general satisfaction and recommendation as well as Trust; Terms & Conditions; Branch Services; Digital Services and Financial Advice. For each criterion a detailed battery of questions was asked. In every state the banks and credit unions with the highest score have been awarded. The length of the top lists in every state varies between 5 and 1 (depending on the amount of evaluations collected and the score). Nationwide banks or credits unions like Bank of America, Wells Fargo or Chase Bank which have branches in at least 15 U.S. states were excluded from the ranking.